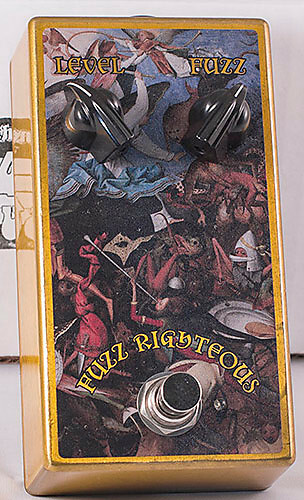 The Fuzz Righteous (from those wacky guys at 424 Studios) is a modern take on the vintage Mosrite Fuzz Rite. It features low-gain silicon transistors and new-production, tight-tolerance passive components to minimize background noise while retaining a classic fuzz tone. We added excessive power filtering and input RF filtering to keep this nasty beast as quiet as possible. The classic circuit is under the hood, but we also added a dual DIP switch to allow the user to change the input and output capacitor values. 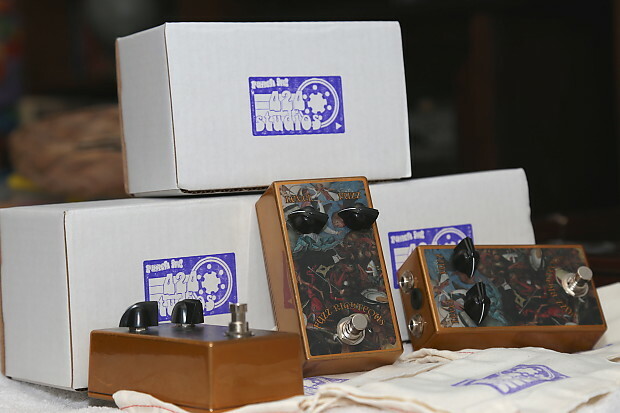 This allows a classic thin brash fuzz, or a more modern full-range fuzztone. Why choose when you can have both? The fuzz itself is aggressive, sometimes "spitty" and sometimes "splatty", depending on how you have the Fuzz control set and your pickup selection and guitar volume settings. There are a lot of sounds in this box. With Fuzz dimed, it's bright and tight aggressive; with Fuzz set low, there is some clean blend and decent octave up overtones with the right guitar pickup and tone settings. 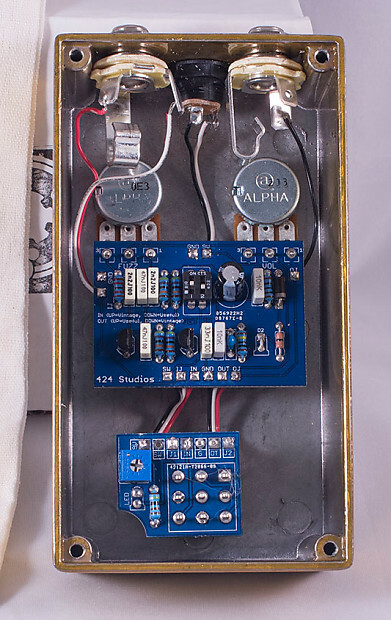 Input, output, and 9V jacks are "top mounted" to take up less space on your pedal board. The enclosure is professionally powdercoated for durable long-lasting finish, and the artwork (Bruegel's "Fall of the Rebel Angels") is UV printed. The LED brightness is controllable via an internal trimmer. • Comes with fun and stylish cloth bag with 424 logo stamped on it! I will ship via USPS Priority or First Class or Parcel Select at my discretion, based on shipping cost and shipping time. All items shipped will include tracking/delivery confirmation via USPS. If you prefer a different shipping carrier, I will accommodate that if you contact me prior to purchase and if you are willing to pay the full cost of shipment. No item will be shipped prior to clearance of payment. Returns of new items are accepted within 7 business days of receipt of item. Buyer covers cost of return shipping + 10% restocking fee for all items.